Wouldn’t it be fun to pick a canvas and have a stitchguide written just for that canvas? 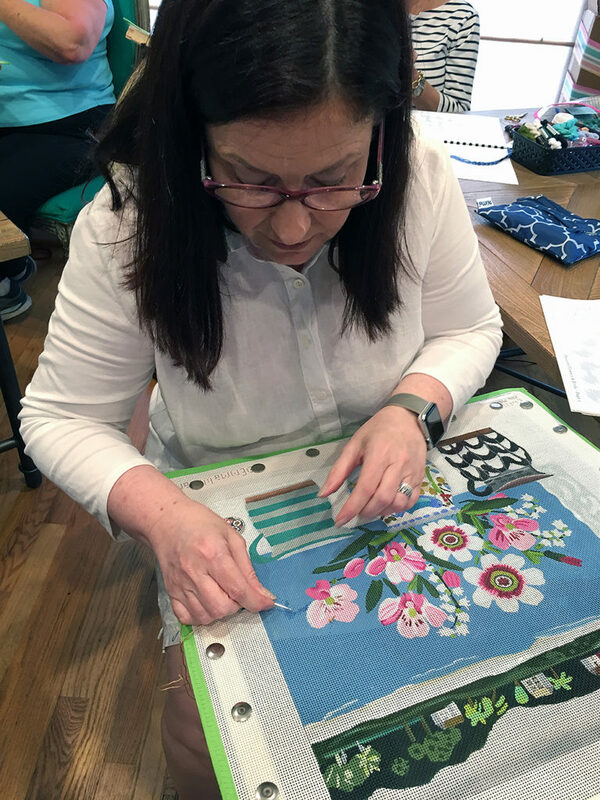 You arrive in class and find your canvas mounted on stretcher bars, at your seat with a fabulous bag of threads and embellishments all chosen to enhance that favorite canvas. SWOON! From there, you will spend 2-3 days stitching this new favorite canvas while visiting with friends and having fun. That is the magic of an embellishment class at the Beehive of Bedecked and Beadazzled. I offer these classes several times a year. Sometimes I am the wizard behind the curtain writing the guide and other times we invite the incomparable Mary Legallet of WhimsicalStitch.com to work her magic. Check your calendar for July 12-14. Can you join us? Mary will be here. The more the merrier! Full details are on the website. Click here. « Previous: Best Class Ever! Mary is a knowledgeable, creative and fun teacher! Enjoy!